In what is now the 5th published volume of Messerli's cultural memoirs -- beginning, ultimately, in 2000 and moving through the years until the writer's eventual death -- Messerli again mixes personal experiences and encounters with annual cultural events in art, music, dance, history, film, poetry, fiction, drama, television, food, performance and popular culture. As fiction writer Thomas Frick recently noted, "In his My Year volumes Messerli has created an invaluable guide to the 21st century, cataloging and exploring numerous of its central cultural moments." The 2007 volume, subtitled "To the Dogs," began as an assessment of where things were heading, as the author perceived, but strangely grew also to be a book that traced actual encounters with the four-legged pet. 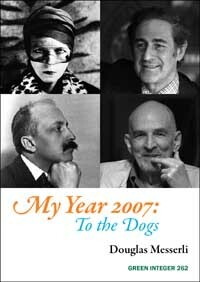 Certainly there were books and films suggesting that the year might be literally devoted to the dogs -- Brazilian author Domício Coutinho's wonderful novel Duke, the Dog Priest (published by Messerli's own Green Integer press), Mike White's new film Year of the Dog, and Cathleen Shines' fiction The New Yorkers (which The New York Times Book Review covered under the same title) -- but who might have imagined as the year moved on that football player Michael Vick would be arrested for organizing and supporting dog fights; that "queen of mean" hotelier Leona Helmsely, upon her death, would leave her white Maltese dog a $12 million dollar trust fund; that the usually laidback television hostess Ellen DeGeneres would publicly break into tears over the news that the Mutts and Moms Adoption Center had taken away her dog, Iggy, whom she had given to her hairdresser's family? Russia celebrated the 50th anniversary of the Soviet dog Laika's flight into space. The same year the author would "coincidentally" view Japanese filmmaker Kurosawa's classic Stray Dog. As Messerli puts it: "It seemed that wherever I turned I could hear the bray or bark of the beasts. By year's end, the metaphor had been turned upside down, my description of the times having been transformed into a toast to man's best friend." Author of the fiction Letters from Hanusse, collections of poetry such as First Words, After, Bow Down, Maxims from My Mother's Milk and Dark, and numerous plays (under the pseudonym of Kier Peters), Messerli is also the author of Reading Films: My International Cinema and numerous anthologies, including From the Other Side of the Century: A New American Poetry 1960-1990. Editor of Sun & Moon Press and, currently, Green Integer, the author was named Officier de l'ordre des Arts et des Lettres by the French government and was awarded The American Book Award and ALTA Award for his publishing. Green Integer is publishing several new, older, and out-of-stock Sun & Moon, Green Integer, and other archived titles on line. Most of these will appear for free. Some will be priced at affordably low prices for our "on net" customers. Ordering through PayPal, customers will be provided with a PDF link within 24 hours of payment so that they can either read the books on the computer or download them to print to other media. Donations for this service are welcome.